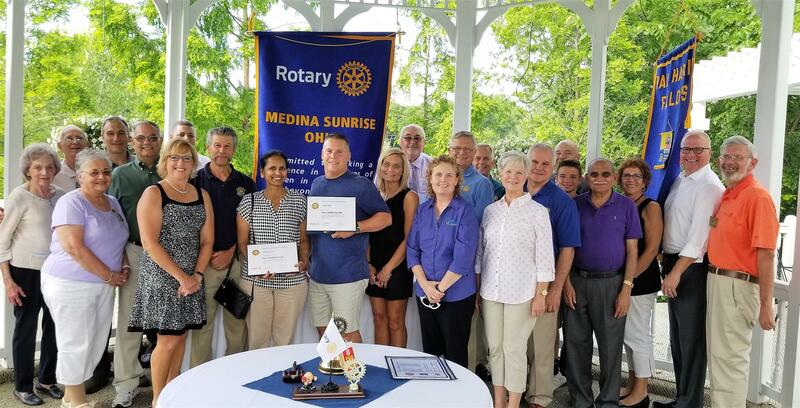 "This evening, Medina Sunrise Rotary proudly gathers together to honor 32 Rotarians and community service leaders whose lives of selfless service have earned them the recognition of a Paul Harris Fellow Award," said Rotary Foundation Chair William Koran. A Paul Harris Fellow is a distinction shared by service-minded men and women in more than one hundred nations, many of whom have made significant contributions to world peace and understanding. Individuals who further these efforts and by contributing $1,000 to the Rotary Foundation can be named a Paul Harris Fellow. A Paul Harris Fellow is also someone in whose memory or honor $1,000 is contributed to the Rotary Foundation. The Rotary Foundation transforms these gifts into service projects that change lives both close to home and around the world. During the past 100 years, the Foundation has spent over $3 billion on life-changing, sustainable projects, including: the eradication of Polio, saving mothers and children, building Peace Centers and sustainable water projects, supporting education and scholarship programs, and providing emergency food, shelter and tools to families around the world who have been robbed of their homes by natural disaster or crisis through our Nobel Peace Prize nominated partnership with ShelterBox. We congratulate our Paul Harris Fellows, and with their help, Rotary can continue to make lives better in our community and around the world.